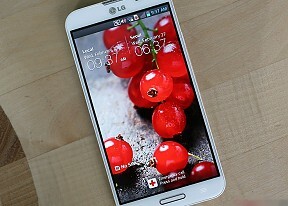 The LG Optimus G Pro boasts a Snapdragon 600 chipset with four Krait 300 cores clocked at 1.7GHz, 2GB of RAM and the Adreno 320 GPU. With specs like that you would expect the phablet to be a real benchmark champion and luckily it delivers. The Optimus G Pro managed to top the Benchmark Pi and Linpack tests, which are meant to judge single and multi-core performance respectively. The 5.5" LG flagship had excellent performance in the two compound benchmarks we run, too. At Antutu it didn't quite manage to come on top, but it still posted a great score of over 20,000 points, while Quadrant saw the LG Optimus G Pro score another victory. Overall, the LG Optimus G Pro is an excellent performer with smooth UI navigation, extremely quick app launches and no lags whatsoever.